My girls adore scavenger hunts. Whether we are on a nature walk, outside, or indoors, they love finding special things as part of a scavenger hunt. It’s easy to build on this enthusiasm by incorporating some of the learning goals they are working on. 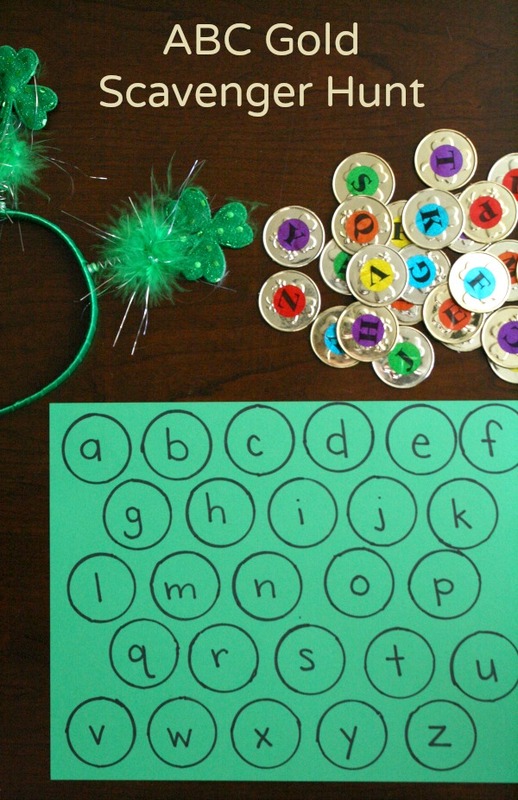 For St. Patrick’s Day we set up this ABC gold scavenger hunt and they’ve had tons of fun searching for gold and practicing the alphabet. 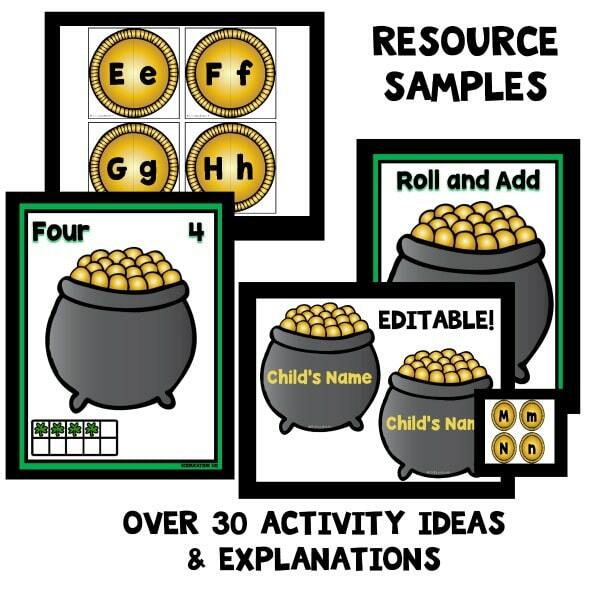 FIND EVEN MORE ST. PATRICK’S DAY IDEAS IN OUR PRINTABLE ST. PATRICK’S DAY THEME LESSON PLANS. All of our materials are from Dollar Tree, but many of them can be found and major stores leading up to St. Patrick’s Day. 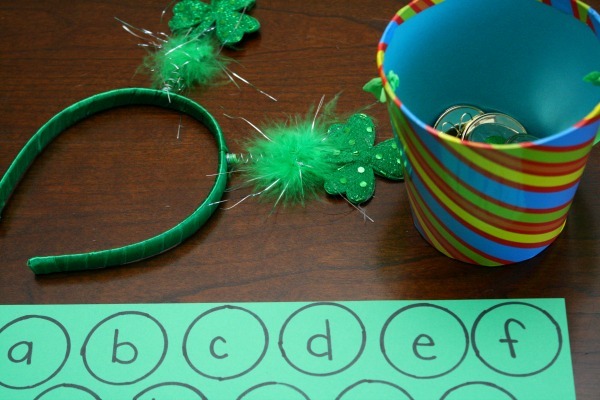 We used plastic gold coins labeled with alphabet stickers, a container for collecting gold, a special “leprechaun” headband, and an ABC checklist that I made by tracing the coins and writing each letter of the alphabet. The checklist serves two purposes. First it helps kids practice matching the letters. You can either match uppercase to uppercase or uppercase to lowercase like we did in this example. And the checklist also helps you figure out if you are missing any gold after the kids are done looking. Trust me–this is handy! When you are ready to play hide the gold throughout the search area (your home or classroom). Then get your little leprechaun in character by putting on the headband or other gear that you have. Tinker loved this part. She would talk like a leprechaun and creep along the floor so she could be “teeny tiny and sneaky” like a leprechaun. Then when she spotted some gold she’d pounce on it like the in the picture below. After finding the gold sit down with the checklist and match the gold pieces. This is a great time to help kids name the letters. 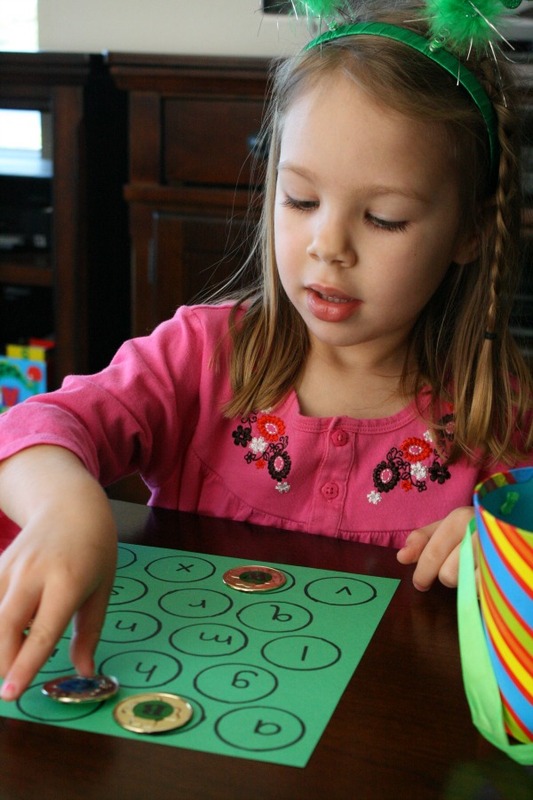 If kids already know the alphabet then you can discuss words that begin with each sound. And once you’ve found all the gold, hide it again and start over! Tinker played this over and over again, and then when her sister got home from school the two of them played over and over too. 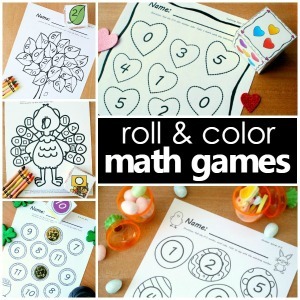 Continue the St. Patrick’s Day learning fun with our Roll and Color St. Patrick’s Day Math Games. 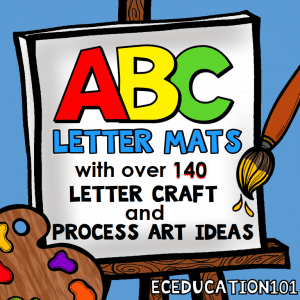 ABC letter mats can be a versatile tool to use in early childhood learning. They can be laminated and used over and over again for letter formation and writing activities. 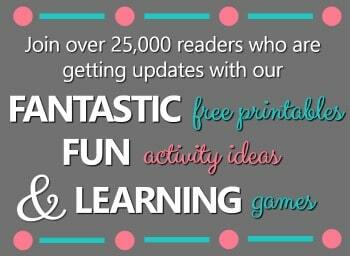 They can also be used to create alphabet books, posters and more. Letter crafts and process art activities related to a letter you are learning can be a fun way for kids to make connections between a letter and something that starts with that beginning sound. In our Alphabet Letter Mats set you’ll find two full sets of alphabet mats to use and tons of ideas for using them. There are over 140 ideas for using the alphabet mats in meaningful ways to reinforce letter recognition and learning letter sounds. 1) Suggestions for Using the Letter Mats-These ideas include ways to use the mats for small group and center activities and can be done for any letter of the alphabet. 2) Process Art Ideas for Each Letter of the Alphabet-60 ideas! 3) Collage and Texture Art Ideas for Each Letter of the Alphabet-54 ideas! 4) Complete sets of alphabet mats in two different font options. My preschool students love this. I have made different games for them to play (upper case to upper case, upper case to lower case and numbers.) I used this as a center and had all the coins in a bucket and had them sort them. they all enjoy completing the activity. It is a great activity that i was able to explain to them and they could do with little to no help. It is very kid friendly and fun for everyone. 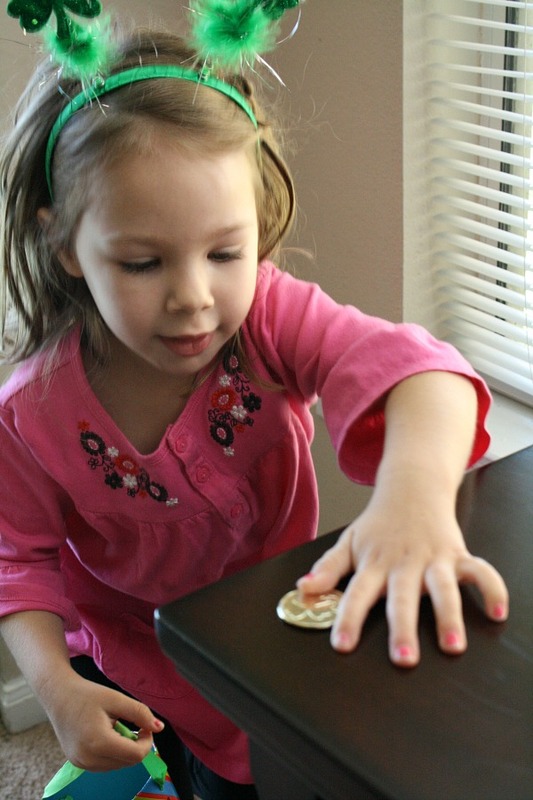 I purchased the gold coins off of amazon for a couple dollars so it was a very cost friendly activity to create. Thank you for sharing! Love this! Just curious how you made your gold pieces? Thanks, Kyra! I purchased plastic gold coins from Dollar Tree and the ABC stickers also available there, and I simply stuck the stickers on. Easy peasy! Super cute as usual, I wish I had time to do this tomorrow! You need to sell pre made kits for working moms!